The formulation and implementation of a strategy. 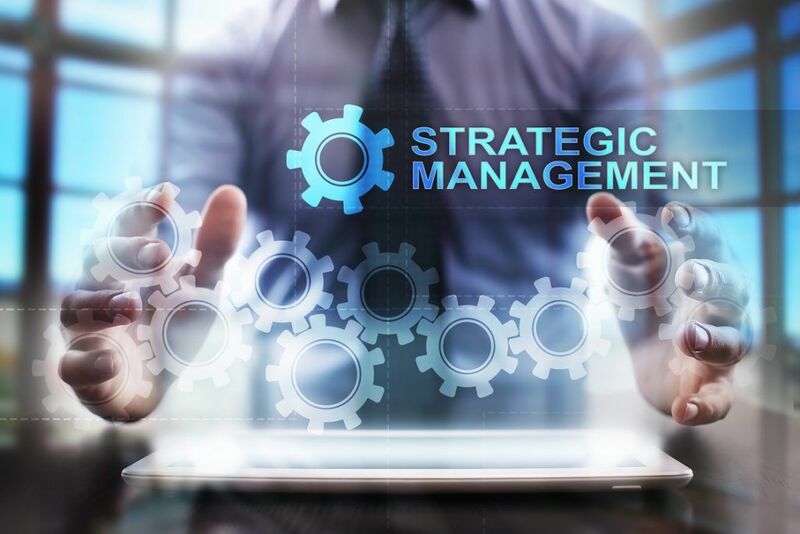 Strategic management is the formulation and implementation of the major objectives and projects, by an organization’s management on behalf of its shareholders (or owners).ShareholderA shareholder can be a person, company, or organization that holds stock(s) in a given company. A shareholder must own a minimum of one share in a company’s stock or mutual fund to make them a partial owner. Typically the formulation process starts with an assessment of available resources, an industry analysis to asses the competitive environment in which the company operates, and an internal operations assessment. From this overall assessment a strategy is then created to achieve the desired goals. Implementation of the formulated strategyStrategyCorporate and business strategy guides. Read all CFI articles and resources on business and corporate strategy, important concepts for financial analysts to incorporate in their financial modeling and analysis. First mover advantage, Porter's 5 Forces, SWOT, competitive advantage, bargaining power of suppliers seeks to steer and align the company with its main objectives. Formulation includes assessment of the environment in which the organization operates and then creating a strategy on how the organization will operate and compete. This is similar to the first step of the budgetingBudgetingBudgeting is the tactical implementation of a business plan. To achieve the goals in a business’ strategic plan, we need some type of budget that finances the business plan, and sets measures and indicators of performance. process. Implementation includes deployment of an organization’s resources to meet the decided objectives. An organization may achieve either lower cost of production or product differentiation as an advantage against its rivals. It is important to look at the market positioningMarket PositioningMarket Positioning refers to the ability to influence consumer perception regarding a brand or product relative to competitors. The objective of market of the brand and company and also pinpoint all the competitive advantagesCompetitive AdvantageA competitive advantage is an attribute that allows a company to outperform its competitors. Competitive advantages allow a company to achieve the company has over its competitors. The Modern Portfolio Theory provides a framework for allocating assets so that for a given level of risk, the expected returnExpected ReturnThe expected return on an investment is the expected value of the probability distribution of possible returns it can provide to investors. The return on the investment is an unknown variable that has different values associated with different probabilities. This guide provides the formula and examples for calculating is maximized. Portfolio Theory allows corporations to perform a cost-benefit analysis on the deployment of resources and view the merit of individual resource placement to the company in totality. The Growth-Share Matrix, developed by the Boston Consulting Group, helps corporations analyze the value of their individual business units by plotting the business on an axis. The two parameters of judgment are market share – a measure of a business unit’s competitive position in regards to its peers – and industry growth rate – a measure of the prospects of the particular industry in which the unit operates. Businesses should seek to develop expertise in areas of relative excellence and eliminate or outsource the remainder of business activities. By being able to do so, an organization can provide a unique and unparalleled product, service, or perspective to the market and consumers. The experience curve expresses the proposition that whenever the output produced doubles, the value-addedValue AddedValue Added is the extra value created over and above the original value of something. It can apply to products, services, companies, management, and other areas of business. In other words, value-added is the enhancement made by a company/individual to a product or service before offering it to the end customer. costs decline by a consistent percentage. Companies should concentrate their strategy on either cost leadership, focus, or differentiation. According to famed strategist Michael Porter, if a company does not place focus on a singular factor, it risks wasting its resources. Such a strategy places emphasis on either specializing in a product or service by creating a unique proposition or creating economies of scaleEconomies of ScaleEconomies of Scale refer to the cost advantage experienced by a firm when it increases its level of output.The advantage arises due to the inverse relationship between per-unit fixed cost and the quantity produced. 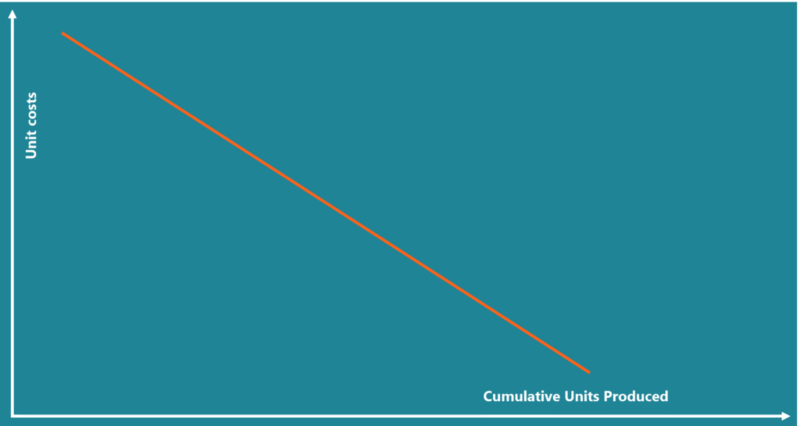 The greater the quantity of output produced, the lower the per-unit fixed cost. Types, examples, guide to achieve low costs to production. Competitive Forces Model (Porters 5 Forces) Competitive Forces ModelCompetitive forces model is an important tool used in a strategic analysis to analyze the competitiveness in an industry. This model is more commonly referris a framework used to assess the competitiveness of the industry. In a competitive industry, the threat of new entrants will be high. Assuming an industry or sector is highly profitable, it will be considered as an attractive business prospect to many. Some deterrents to ease of entry into a market include patents, high capital requirements, customer loyalty to established brands, and existing economies to scale. If a product or experience can be easily duplicated with a similar alternative, the demand for that product is said to be diluted. If consumers can find similar alternative products, the industry or sector is deemed to be competitive. Customers will enjoy a high bargaining power in a market. Sellers will not be able to exert pricing pressure that will favor their profitability. Several suppliers are present to source raw or intermediary materials. Suppliers are not able to influence the final price in an unjustifiable way. Competitive industries enjoy a high degree of innovation and evolved competitive and marketing strategies. SWOTSWOT AnalysisA SWOT analysis is used to study the internal and external environments of a company and is part of a company’s strategic planning process. In addition, a is an acronym for Strengths, Weaknesses, Opportunities, Threats. 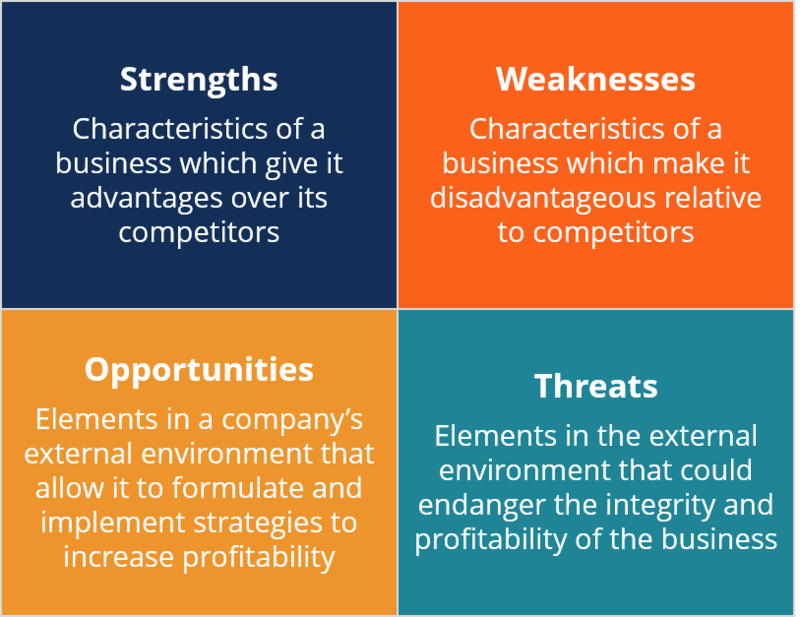 Namely, the framework is employed to assess internal strengths and weaknesses and explore the external scope of opportunities available for the business to exploit and threats presented by opponents or policies. They include functions that go into directly creating the good or service. They consist of functions such as inbound and outbound logistics, operations, marketing and sales, and servicing the product. They include functions that facilitate the production of the good or service. They consist of functions such as human resources, technology, procurement, and infrastructure. According to Porter, aligning the activities can improve the operational efficiency of the organization and ultimately create a competitive advantage for the company.